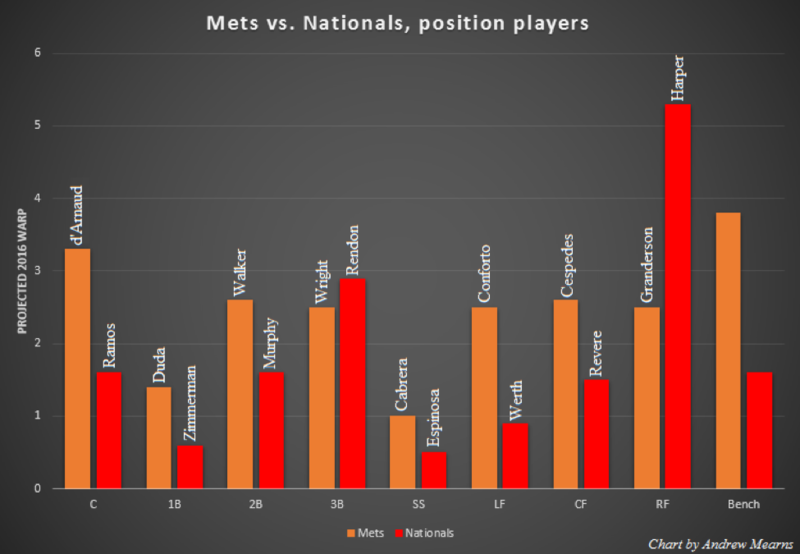 Mets vs. Nationals: What Are The Projections Missing? Baseball is upon us! Expectations in Queens are high this year and Baseball Prospectus’s projections forecast the Mets will narrowly win the division (again!). Projections can be myopic though. 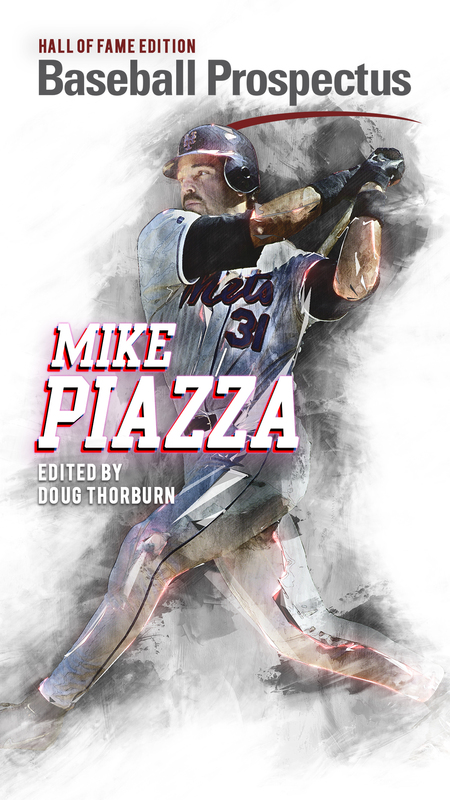 Last year, analysts held a preseason coronation for Washington before they ceded their crown to the Mets once the games were played. This year, projections are far more favorable to the deep, balanced Mets while Washington is forecasted to be a high variance team. 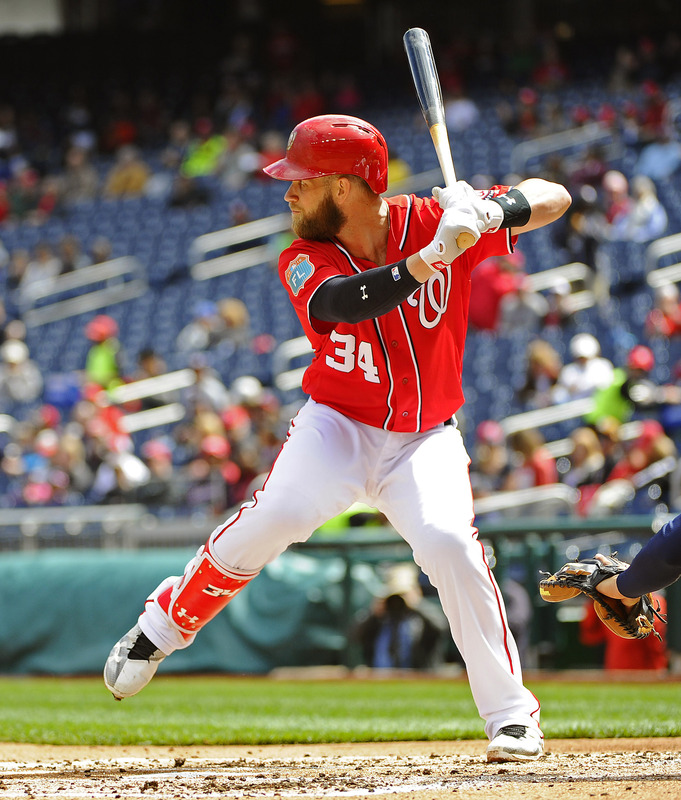 As good as the Nationals have been recently, it’s clear that GM Mike Rizzo has failed to surround Bryce Harper with enough talent. Rizzo’s “Star and Scrubs” roster will require Harper to carry a lineup littered with talented, but flawed players. It bears repeating, however, that Harper’s regressed projection is less than half his 2015 production–11.2 Batter Wins Above Replacement Player, or BWARP, in 2015–and despite Harper’s historic season the Nationals still missed the playoffs. To put last year in context, Harper’s BWARP was higher than any single Mike Trout season and was equivalent to prime Barry Bonds. It’s possible, even likely, that the projection for Harper is too conservative–he is a generational talent after all. Then again, if Harper does not replicate his 2015 season, it’s difficult to foresee the Nationals surpassing the Mets. … Trea Turner. Not a bad option! Though, that it is an option at all is shortsighted. In a patent effort to claw back Turner’s service time, the Nationals will start Danny Espinosa (0.4 BWARP in about 250 PA) over their top shortstop prospect. The Mets made a similar decision by acquiring Neil Walker instead of handing second base to the young, inexperienced Dilson Herrera, but Rizzo’s decision is distinguishable. Espinosa has proven to be a below average hitter without any upside over a period of six seasons. The only variation in his value has been due to playing time and defensive output. 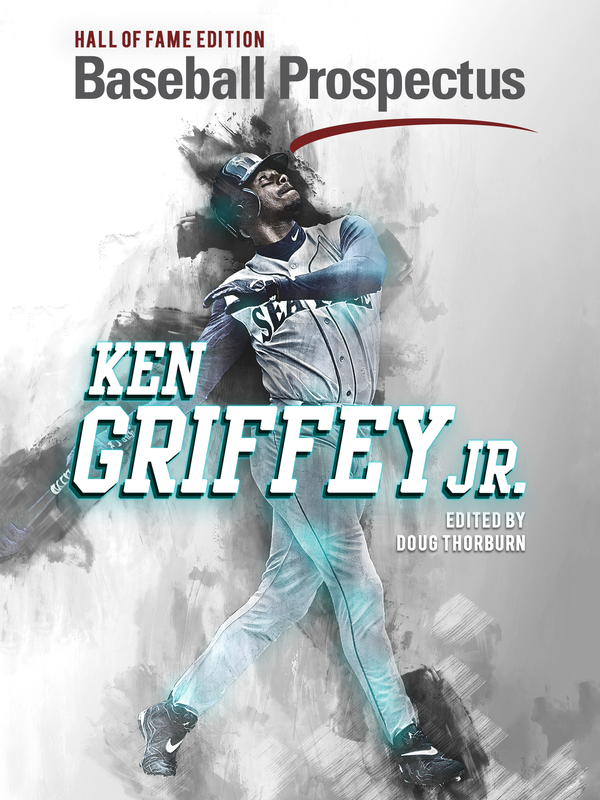 If he is an average defender at shortstop, he is, at best, an average player. In contrast, Walker was consistently above-average in Pittsburgh and will not be playing out of position; Espinosa played just 50 innings at shortstop last season. It’s difficult to justify stashing a high-upside option like Turner at Triple-A while Espinosa starts for three months. The Nationals should be starting Turner for his upside, in large part, because they cannot rely on healthy, productive seasons from Jayson Werth or Ryan Zimmerman. Werth was very productive for a decade, but is now 37 years old and is overcoming wrist and shoulder injuries. Zimmerman, 31, has been constantly injured and was limited to just 95 games last year. This is where the the Nationals’ lack of depth becomes an issue. If Zimmerman and Werth cannot remain on the field and match their 2014 output–.294 TAv and .319 TAv, respectively–the Nationals are going to be in trouble. Why? Because the best alternative to each is Clint Robinson. The Mets’ depth should prevent a similar fate with their aging veteran in the outfield, Curtis Granderson. Granderson reinvented himself as a leadoff hitter last year and posted a 5.5 BWARP season after he struggled during his first year in Queens. Entering his age 35 season, Granderson is also the Met most likely to regress. Luckily, the Mets can rely on Juan Lagares as their “utility” outfielder to protect Granderson from left-handed pitching. If Michael Conforto plays every day he may be the Met most likely to outperform his PECOTA projection. However, I am concerned that Terry the Tinkerer will stunt Conforto’s development by platooning him with Juan Lagares or–gasp–Eric Campbell. It seems obvious that Granderson should sit against left-handed pitchers given his age and career split, but Collins loves Granderson atop the Mets’ lineup and is unlikely to sit him. Instead, expect Collins to constantly rotate Lagares and de Aza into lineup at the expense of Conforto’s playing time. To put the above visualization in context, last year Clayton Kershaw was projected for 5.3 BWARP and the top 10 pitchers excluding Kershaw are projected for 3.3 BWARP. The Mets and the Nationals are obviously stocked, both are the only teams with three pitchers in PECOTA’s top 25. 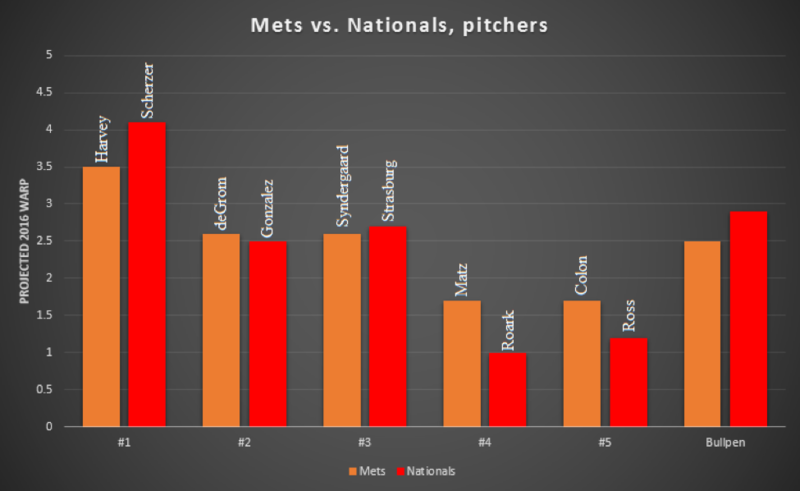 Despite the hype surrounding Mets’ top three, Max Scherzer (third), Stephen Strasburg (20th), and Gio Gonzalez (25th) will more or less match Matt Harvey (eighth), Jacob deGrom (23rd), and Noah Syndergaard (24th). It wouldn’t surprise me if the Mets had three starters in the top 15 by year’s end. While both teams will rely heavily on their trios, each has enviable upside in the back of their rotation. For the Mets, it is Steven Matz and Zack Wheeler. Injuries have stalled both players’ development, but each has the pedigree to greatly outperform their projections. Wheeler should join the Mets when his Tommy John rehab concludes in July, and if he stays on track he should easily surpass the 40-inning PECOTA projection after he replaces Colon in the rotation. PECOTA believes that when Tanner Roark returns to the rotation this year he will continue to be a strike-throwing innings-eater. His upside is limited, however, by his inability to miss bats. The Nationals will be content if Roark can work deep into games and avoid home runs until Lucas Giolito is ready. Unlike Trea Turner, the decision to break camp without Lucas Giolito in the rotation is defensible. Giolito has only thrown 50 innings above Double-A and with just 20 days off the 25-man roster the Nationals can secure an additional year of service time. After the service time clawback period lapses, the question becomes how long will Rizzo waits to call up the top pitching prospect in baseball. While Roark and Ross are serviceable, if Giolito is ready to contribute he should be called up immediately once the extra year of service time is secured–that way, the Nationals secure the benefit of as many of his 140 innings as possible. Each of these teams have a clear path to the division title, but the Mets, due to their balance and depth, are in a better position to overcome the obstacles they’re faced with. Any team with Bryce Harper is a threat, but one must wonder if the burden of carrying these Nationals is just too much without help from Turner and Giolito. Thanks to Andrew Mearns for visualizations.